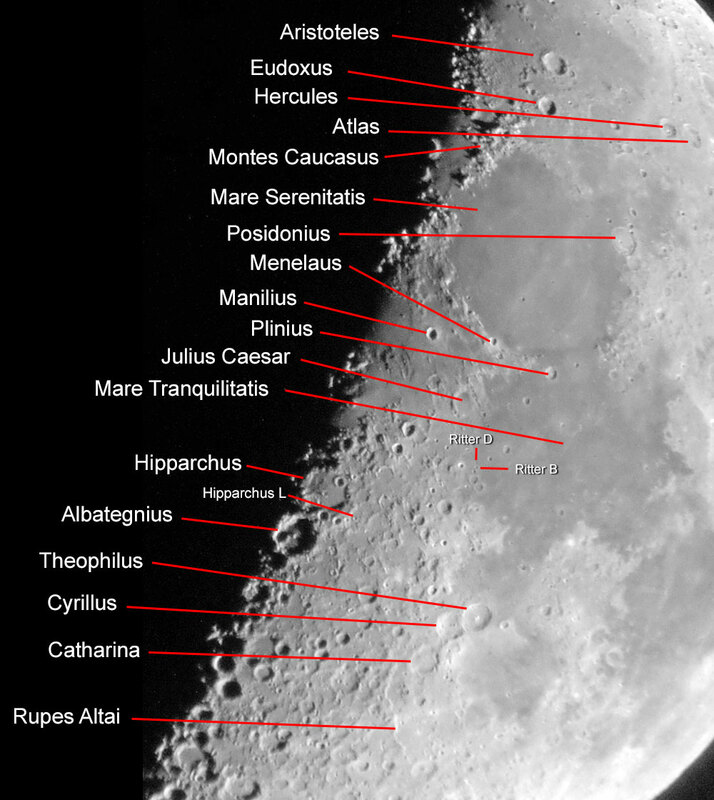 On this page and on a second one, I present enlarged sections of certain regions on the moon so that the objects are easier to recognize. 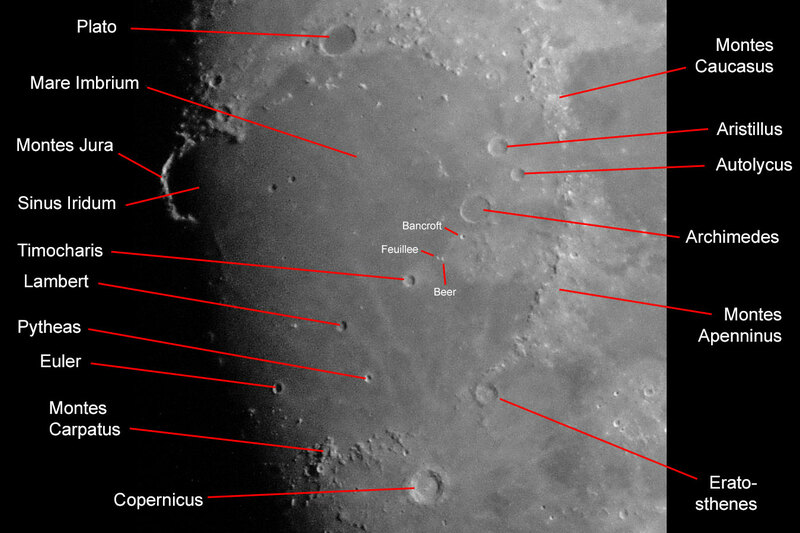 See also Sections of Moon Photos - Part 2 - Back to the overview of my "moon walks". 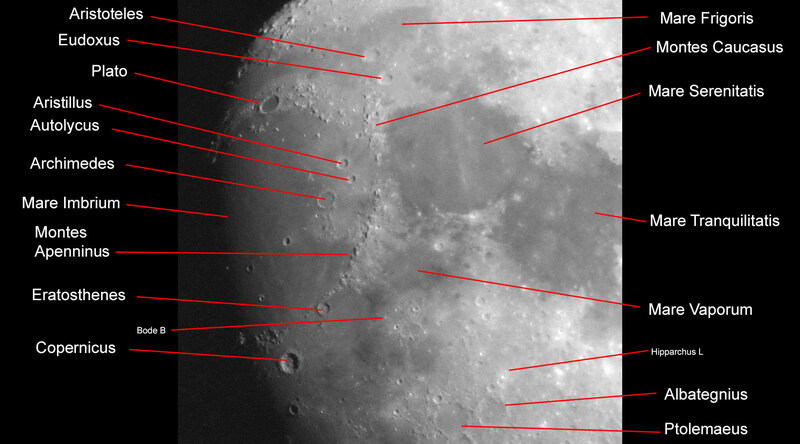 On this page and on a second one, I present enlarged sections taken from other photos in order to highlight certain details. 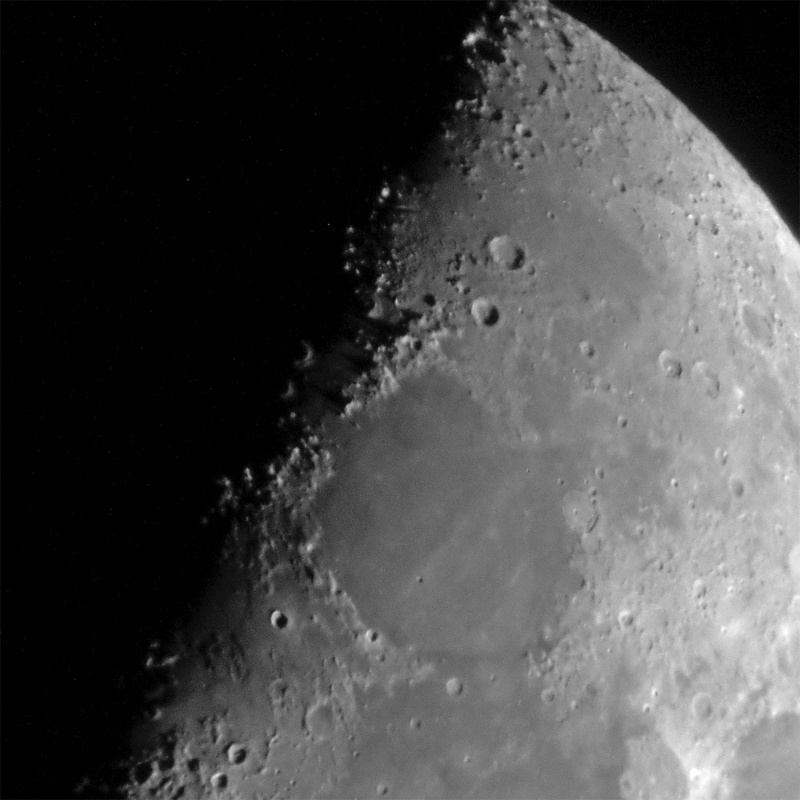 The photos are rotated by 180 degrees or mirrored so that they correspond to the normal visual impression, but they are often somewhat skewed. 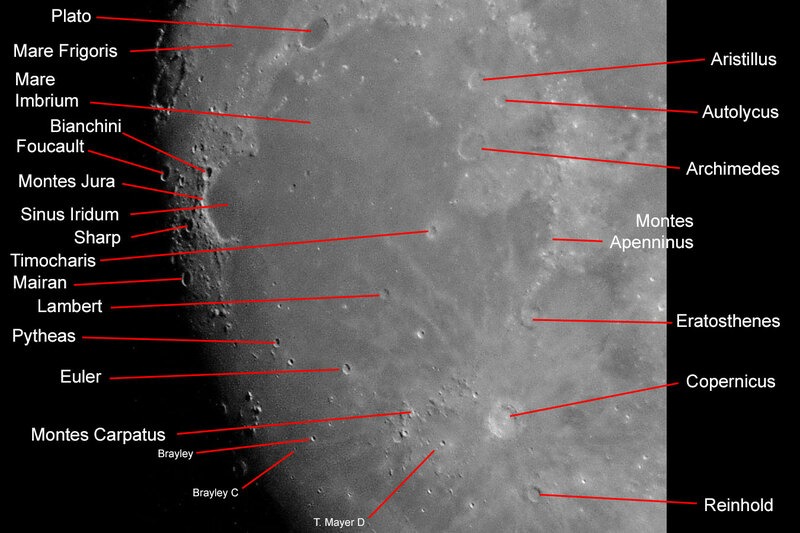 See also Sections of Moon Photos - Part 2. 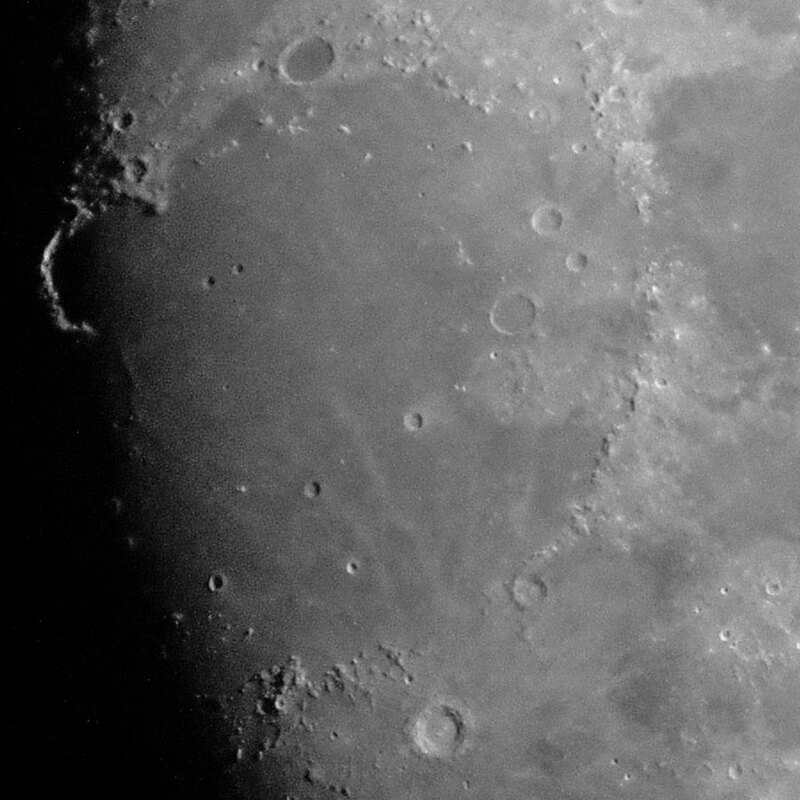 The crater Plato was illuminated by the sun on February 23, 2018 (Half Moon at shortly after 9 a.m.). 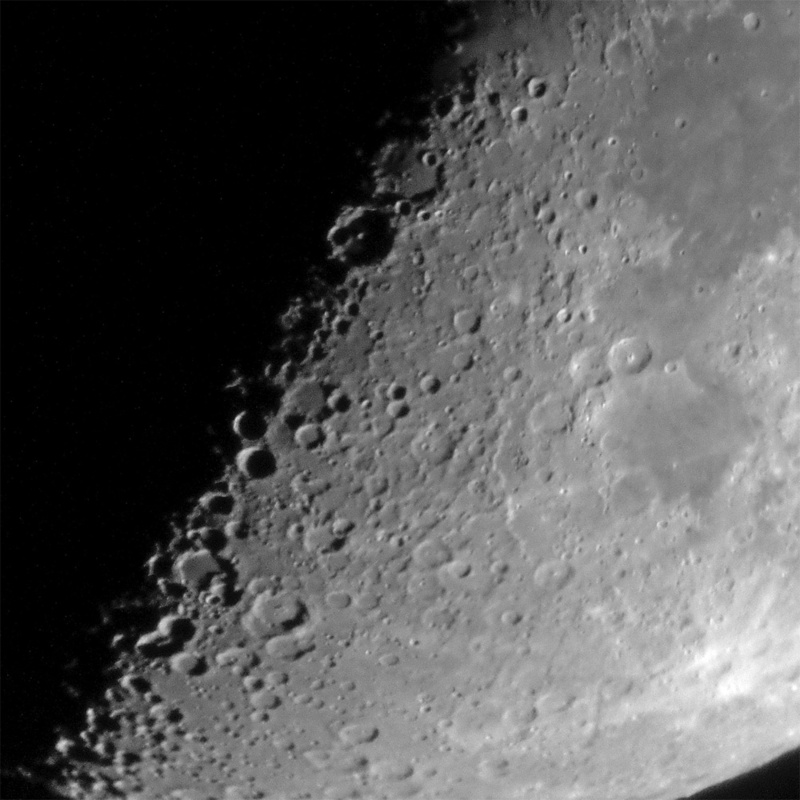 Aristillus B (8 km diameter), Kirch (12 km diameter), and Egede A (13 km diameter) serve as examples of small craters that can be recognized. 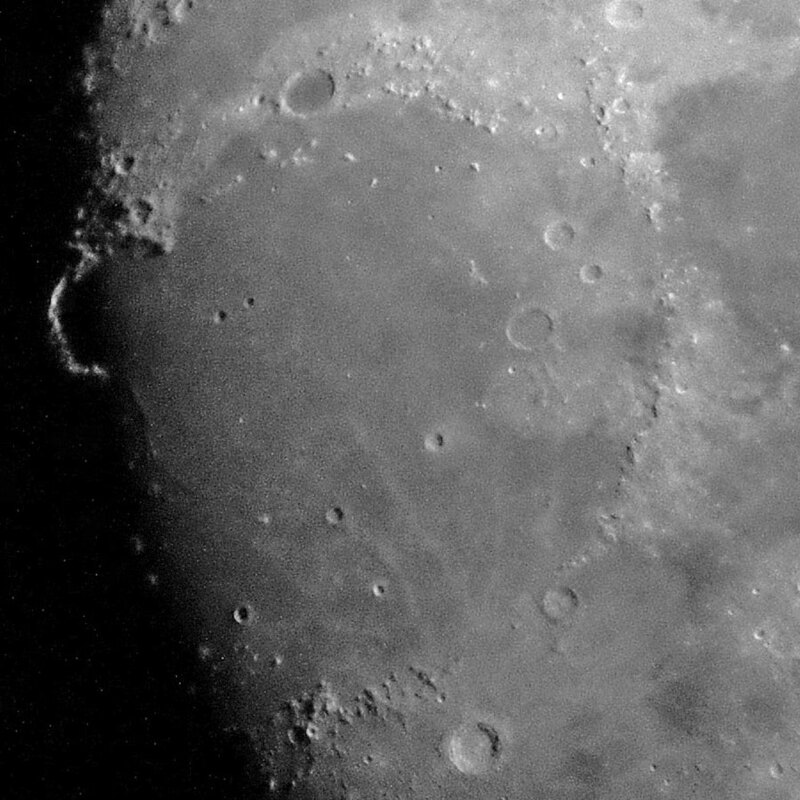 On February 24, 2018 (one day after Half Moon), the crater Copernicus appeared very nicely in the center at the terminator. 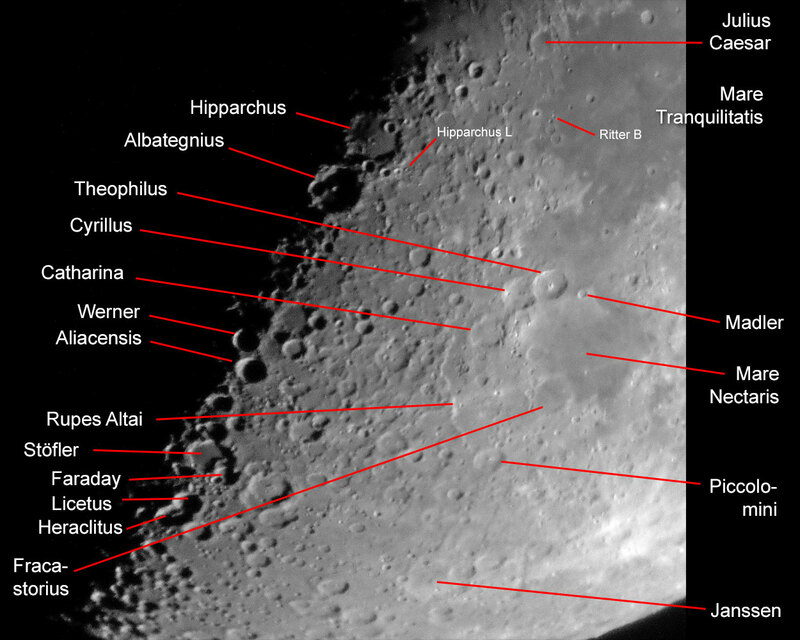 Two sections showing the craters Kopernikus (bottom left) and Plato (top center). 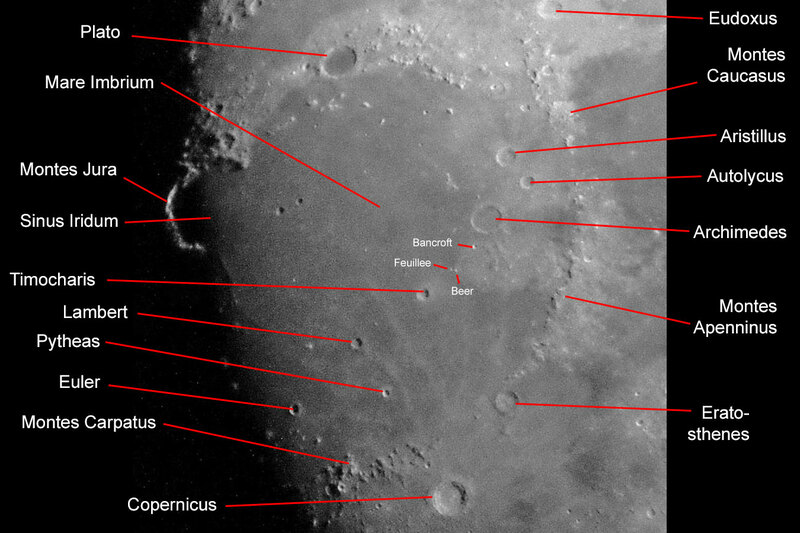 Bancroft (13 km diameter), Feuillee (10 km diameter), and Beer (10 km diameter) serve as examples of small craters that can be recognized. 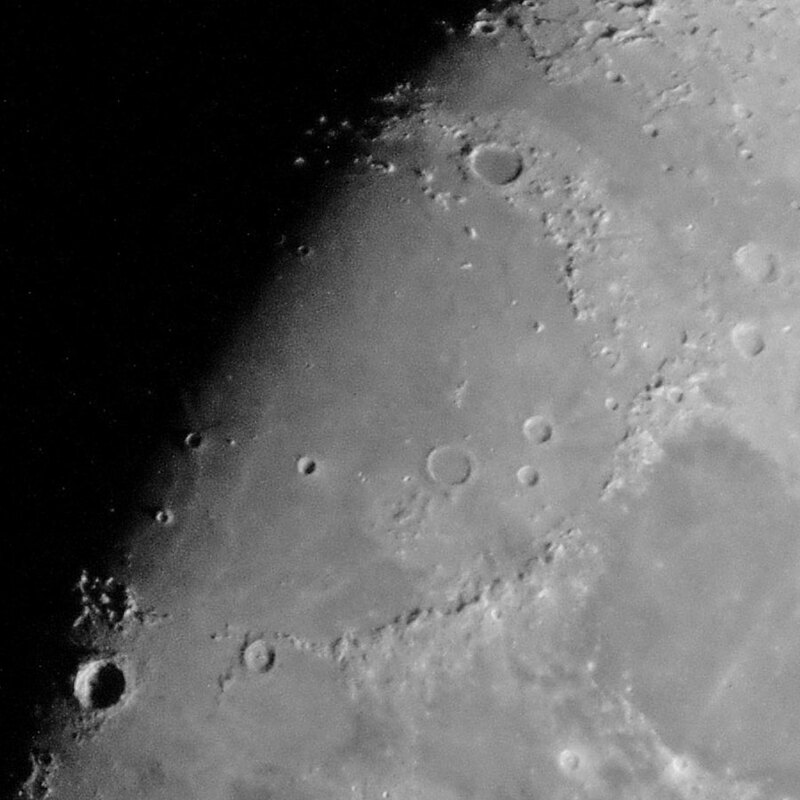 On February 25, 2018 (two days after Half Moon), the Jura mountains looked very nicely in the North at the terminator. 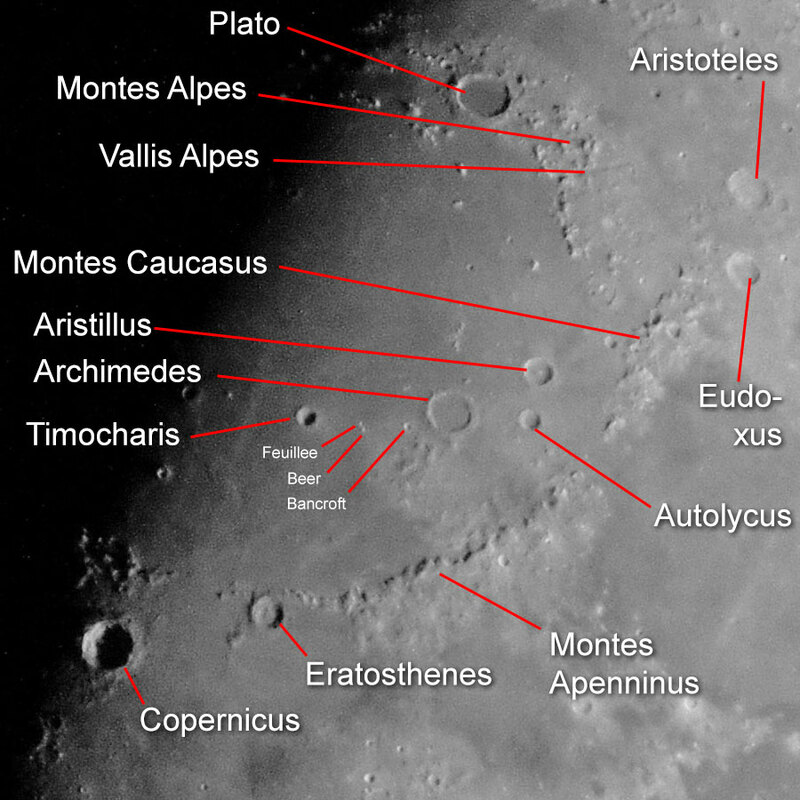 Two sections showing the Jura moutains (top left) and the craters Plato (top) and Copernicus (bottom). When the Jura mountains appear at the terminator and are lighted by the sun while still extending "into the darkness", this phenomenon is called the "golden handle." 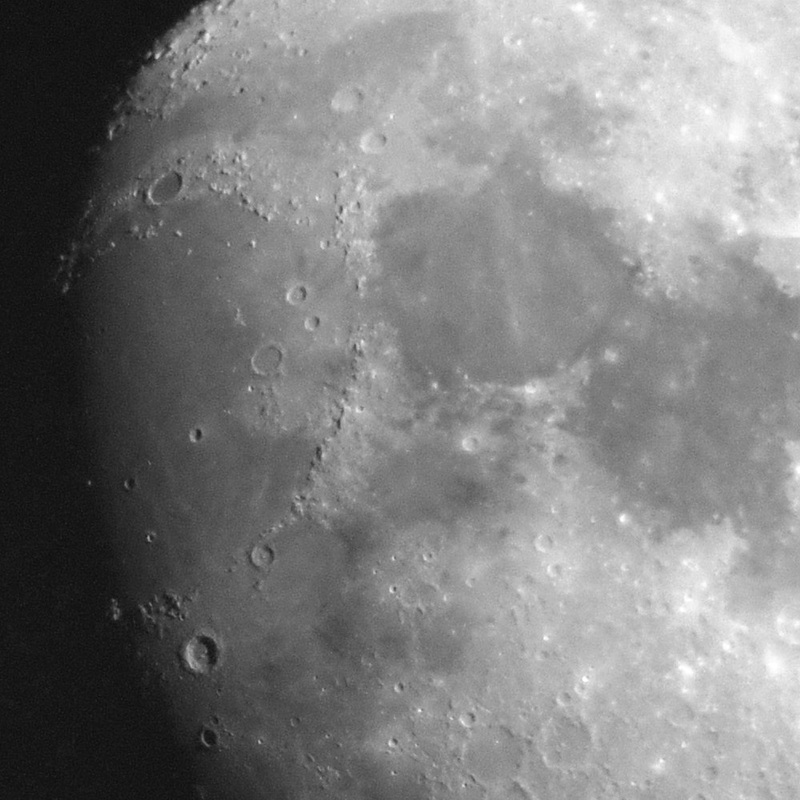 One day later, the terminator has left the Jura mountains. The following section from February 26, 2018 (three days after Half Moon) has been made lighter and shows again the Jura mountains (top left) and the craters Plato (top) and Copernicus (bottom). 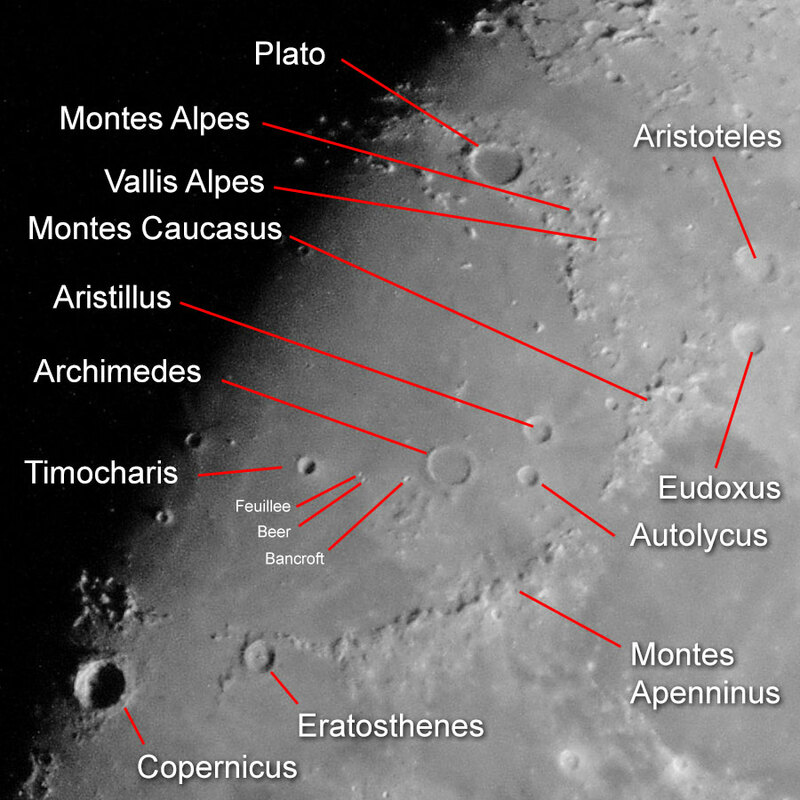 Above and to the left of Copernicus you will find the Montes Carpatus. 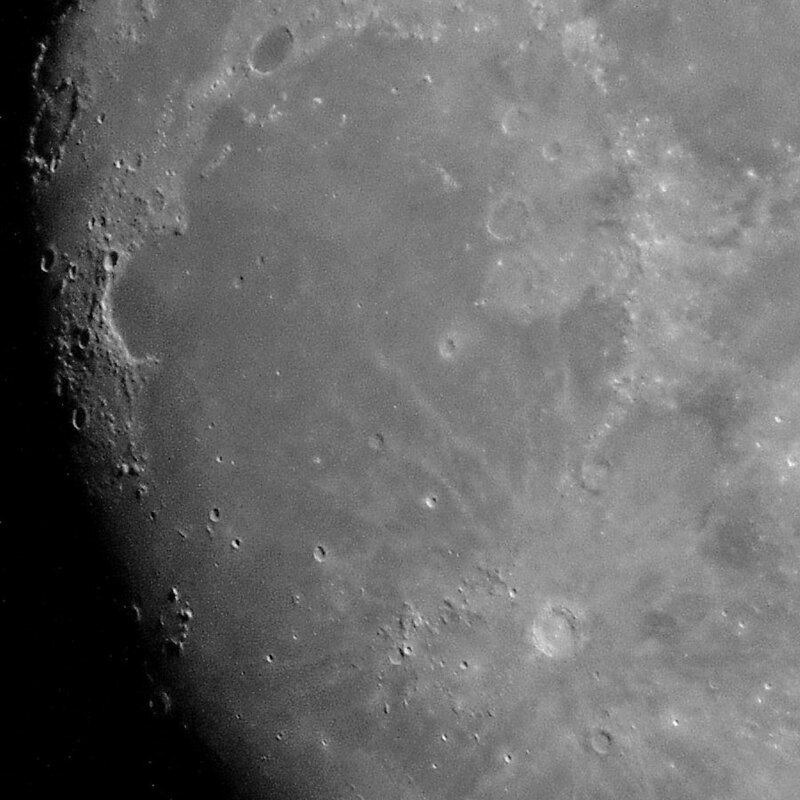 T. Mayer D (8,6 km diameter), Brayley (15 km diameter) and Brayley C (9 km diameter) serve as examples of small craters that can be recognized on the photo. 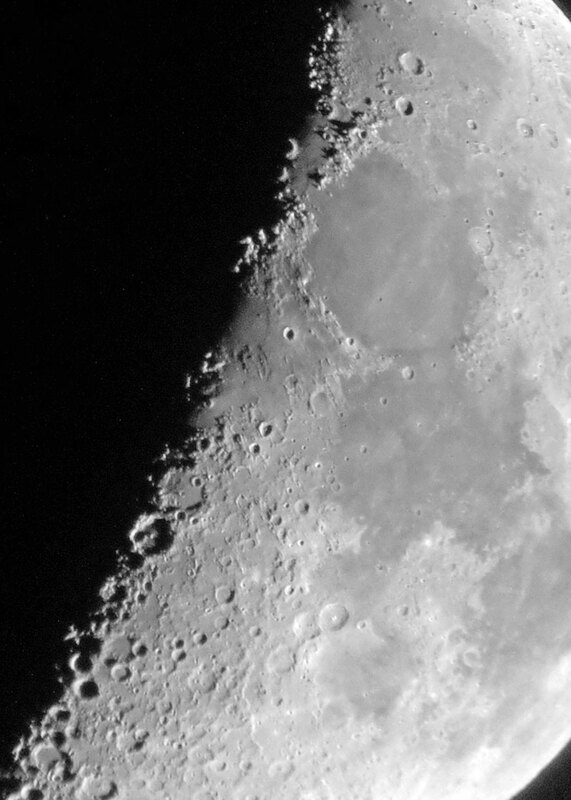 Two sections from a photo of the moon that was taken with the Sky-Watcher Explorer 150PDS telescope and the camera held to the eyepiece ( Mai 5, 2017, two days after Half Moon, which took place on May 3, 2017). 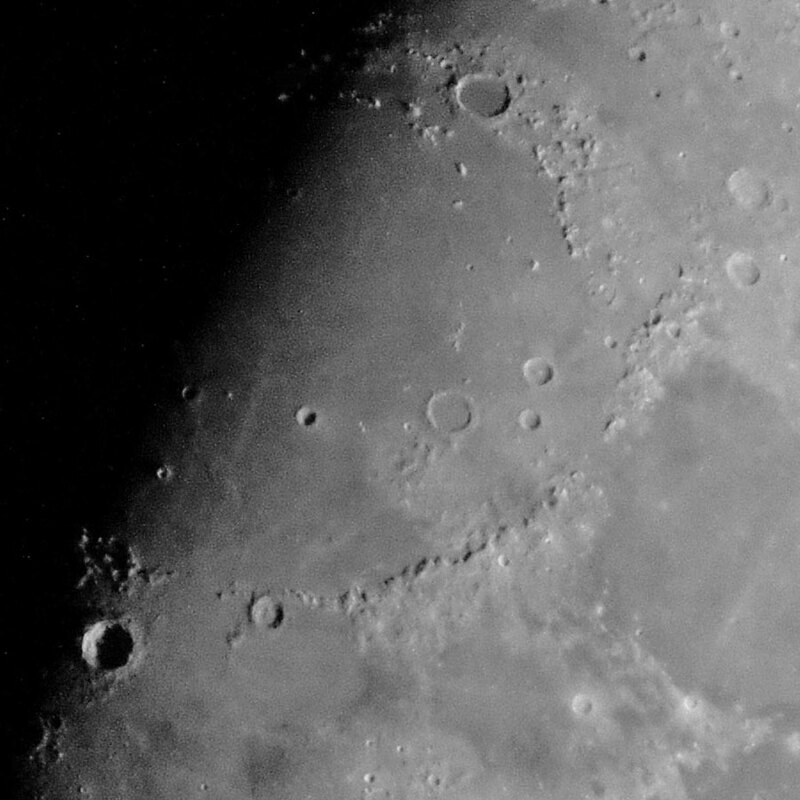 Bode B (10,2 km diameter) und Hipparchus L (13 km diameter) serve as examples of small craters that can be recognized. 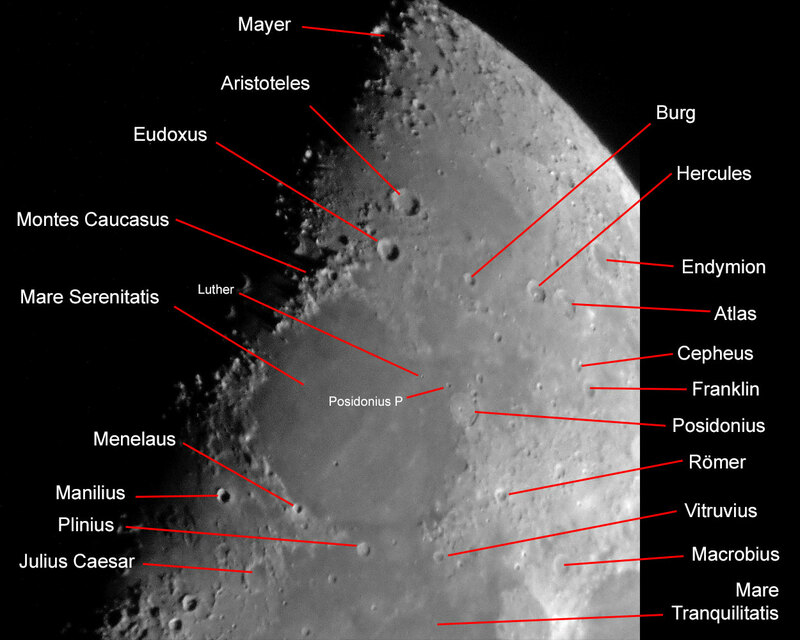 Luther (10 km diameter) and diameter P (15 km diameter) serve as examples of small craters that can be recognized on the upper photo, Ritter B (14 km diameter) und Hipparchus L (13 km diameter) on the lower one. 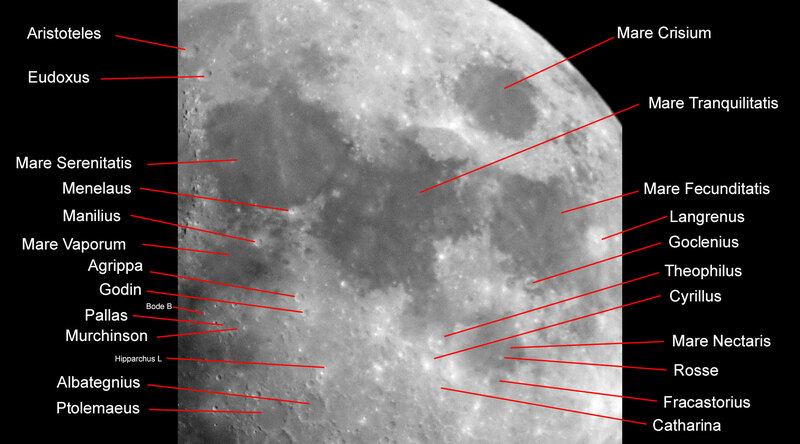 The following section was taken from a photo of the moon that was taken on February 22, 2018, one day before Half Moon. 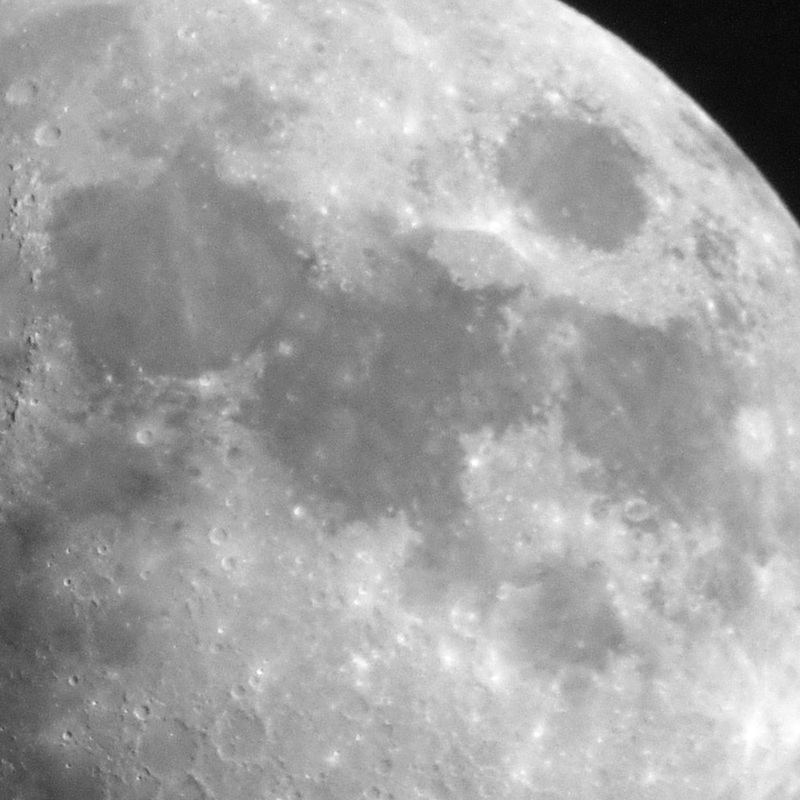 The photo was taken with a Sky-Watcher Skymax-127 and the canera was once again held to the eyepiece. 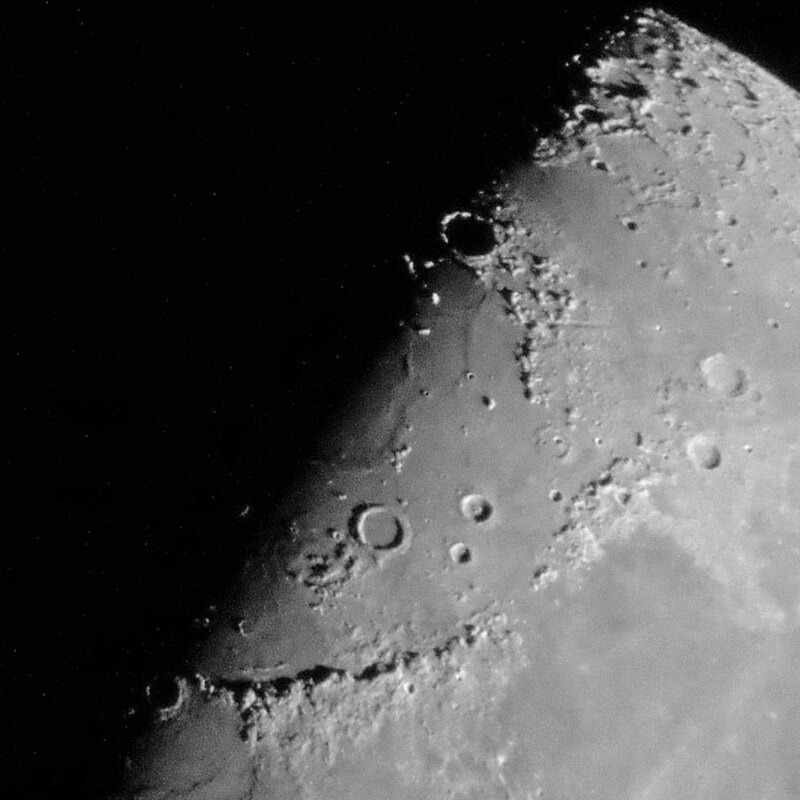 Ritter B (14 km diameter), Ritter D (7 km diameter, hard to see) and Hipparchus L (13 km diameter) serve as examples of small craters that can be recognized.